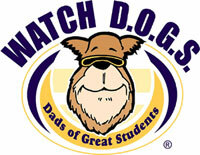 Become a WATCH D.O.G.® at Kaneland Blackberry Creek Elementary and get to see your child's school from their eyes and be their hero for the day! Sign-up today! What is WATCH D.O.G.S.? This is a great K-12 program that invites fathers, grandfathers, uncles, or other male figures to volunteer one day at Kaneland Blackberry Creek Elementary School. Please sign up below and you will receive a reminder email 2 days prior to your day. PLEASE READ THE REMINDERS BELOW, SOME NEW THIS YEAR! The sign up below is for the 2018-19 Year. We ask that you can only sign up for one day due to limited number of days offered. If you wish to only volunteer for a 1/2 day, please list in the "My comment" section "AM only" or "PM only" for your day so that we can make our school administration aware. Will I be spending time with my child(ren)? We will have you with your child at some point, but not all day. We have needs in many classes at every grade level and could use your help. What do I bring for the day? Dress for the weather because you may go outside to help with recess. Bring your lunch and yourself ready to have some fun! What can I expect to do during the day? Your schedule will start with monitoring the entrance and drop off. Then you will be assisting in various classes, lunches, and most likely recess! I have off of work in a couple days unexpectedly, can I sign up today? We do ask that you sign up for a date at least 2 weeks in advance so that the school administration can make your schedule for you and prepare for your day. Last minute sign ups will not be accommodated, sorry. I had so much fun last year, can I sign up for a week this year? We ask that you only sign up once per semester, so one time during this sign up. 2nd semester will be available later in the year. You can email [email protected] with any questions. Thank you for being a Watch DOG! Look forward to helping, hope to spend some time with Addison and Jerry while I'm there! Would I be able to work a 1/2 day that day? I’m requesting a half day with Ethan Runestad in the AM (Mrs. Zurko) and Addison Runestad in the PM (Mrs. Babich). Jackson & Audrey are my kids - Brady and Emily are my nephew & neice.